Submitted by Alexander Briones on Jan. 8, 2019. First published on July 21, 2016 and last updated on January 8, 2019 by Alexander Briones and Jason Horton. If you have an acoustic-electric guitar, or if you are planning to install pickups to your acoustic instrument, you'll need specially tuned acoustic amps. While regular guitar amps can work, they are usually not designed to bring out the natural tone of acoustic instrument. This is where we come in with our list of the best acoustic amps, based on analysis of the most recent reviews and ratings. These combo amplifiers are designed to be transparent and have wider frequency range, thanks to the HF driver (tweeter) that they usually come with. In addition to working well with acoustic guitars, these amps are also known to work well with vocals and other acoustic instruments using close mics or pickups such as violin or ukulele. Examples include hand percussion being miked and amplified via an acoustic amp, while others simultaneously put keyboards and guitar through some of the amps that have multiple channels. At 50 watts and below these amps are good for practice and playing small venues like cafes - unless you mic them up or send output to a PA system they generally won't cut it on outdoor stages or larger indoor venues. The Yamaha THR5A is a portable acoustic guitar combo amplifier that's meant for modern desktop recording use, with compact 3" speakers that provide just the right volume for home recording and practice. Its standout feature is the built-in VCM (Virtual Circuit Modeling) technology, which allows this compact amp to emulate different mic types. Also included are nifty effects which include compressor, chorus, delay, reverb and more. Finally, the Yamaha THR5A can run on 8 AA batteries for up to 6 hours of portable use. Many are impressed with the Yamaha THR5A's sound quality, impressing many steel string acoustic guitar players. Even nylon string guitar players chime in with their high ratings and approval. The quality of its build-in effects also get a number of commendations, along with its portability and furniture friendly aesthetics. No complaints about its sound or features, but there are a few who wished for more output options, like a DI out. If you're looking for a portable acoustic guitar amp, or you want a convenient way to record acoustic-electric guitars, then this amp is for you. The AS50D is a versatile and very popular 50 watt 2-channel amp that serves both as a guitar amp and a small PA system. In smaller venues this is all you need for singing and playing, but at larger venues you can use it as your stage monitor and send either the line out, or preferably the balanced DI signal, directly to your mixer. The inclusion of phantom power on the XLR mic input means you can use live condenser microphones in addition to dynamic mics. Dimensions: 21.65" x 16.34" x 10.04"
It's difficult to say which aspect of this amp got the most positive comments in customer reviews because everything from it's tone to how well it performs when putting guitar and vocals through it simultaneously, and of course the value for money, are constantly praised. Both steel string and nylon string players love this amp. There are reports of the amp working well in small to medium size venues, as well as in church sanctuaries. There were no consistent complaints about this amp in customer reviews. After reading through hundreds of customer reviews on more than 10 acoustic amps in this power range, I can say that this is definitely the amp acoustic guitarists like the most in the 50-watt and under category. These amplifiers are in the range that are loud enough for many mid sized venues and for practicing with a full band. 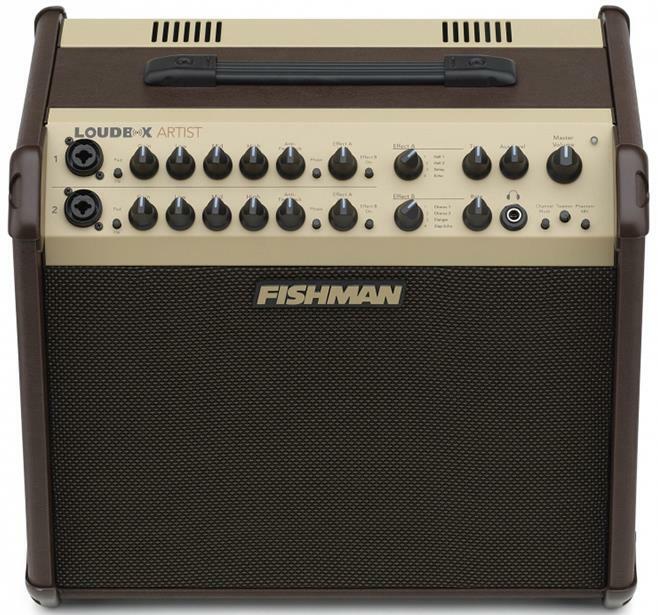 The Loudbox Mini is Fishman's smallest and best selling acoustic amp and is still the most popular one after our updated analysis of this category, with over 700 ratings and references. It's a 60-watt amp with 2 channels - one for instrument input and the other for vocals with XLR input for dynamic mics (no phantom power). The built-in reverb and chorus can both be used on the instrument channel with just the reverb available on the mic channel. The instrument channel also has a phase switch to help prevent feedback. In his review for Premier Guitar, Charles Saufley said "the Fishman Loudbox Mini is an exceptional acoustic amp that sounds bigger, richer, and more expensive than its size or price would suggest". Customer reviews have similar sentiments with many saying they are very happy with the amp's great clear and clean sound, and value for money. Many customer reviews pointed out that although it works well for small shows, it doesn't have the power needed to project at larger gigs or as part of a band unless you're using it as a stage monitor and DI with the signal being sent to the PA system. A few people said they've had problems with hum with one even lamenting that Fishman should have included a ground lift switch to help prevent it. For solo work, practice, and small venues this amp works well and it's your best choice if you want to get a Fishman amp but have a limited budget. This is a 2-channel stereo amp with a total of 60 watts power. As with the AC-33, one channel is for your instrument and the other is a Mic/Line channel. The AC-60 is not simply a more powerful version of the AC-33 - it has a different feature set designed more for stage and studio use without the AC-33 features designed for buskers and street performers. It has a dedicated subwoofer out which means with the addition of a subwoofer this amp should produce a solid sound with an acoustic bass as well - some people also use subwoofers with this amp for regular guitar because they like the sound of it. There is also an identical but rosewood colored version with the model number: AC-60RW on Amazon.com. Dual XLR outs let you send a mono or stereo signal to a mixing console prior to the master volume when using the AC-60 as a stage monitor. Weight: 21 lbs. 10 oz. 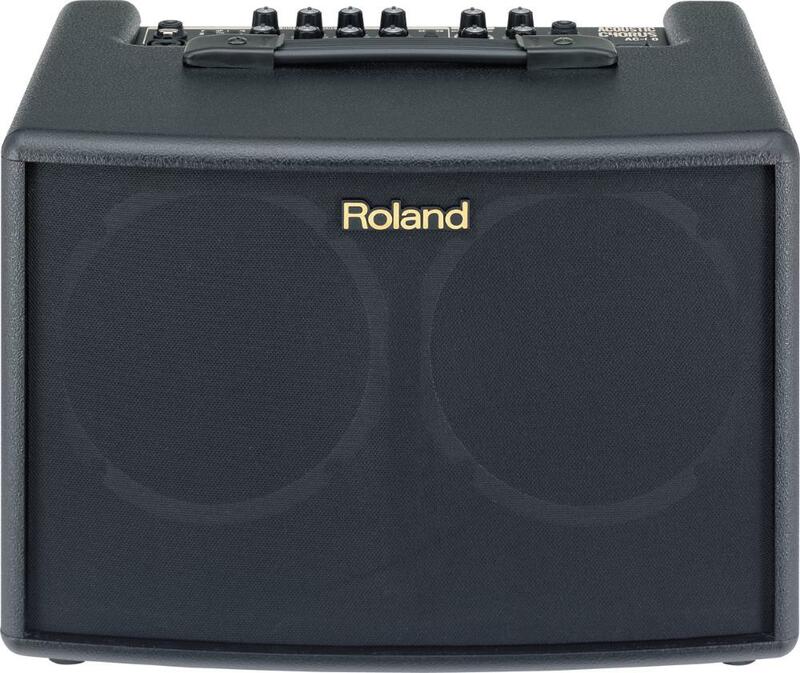 Dimensions: 10.56" x 15" x 10.69"
Not only do guitarists give this amp positive reviews citing the clarity and tone of the AC-60, but I've also seen violinists using both mics and pickups saying the same. Customer reviews also rate it highly when used both as a primary amp and as a stage monitor. It also received positive citations when also used for vocals. 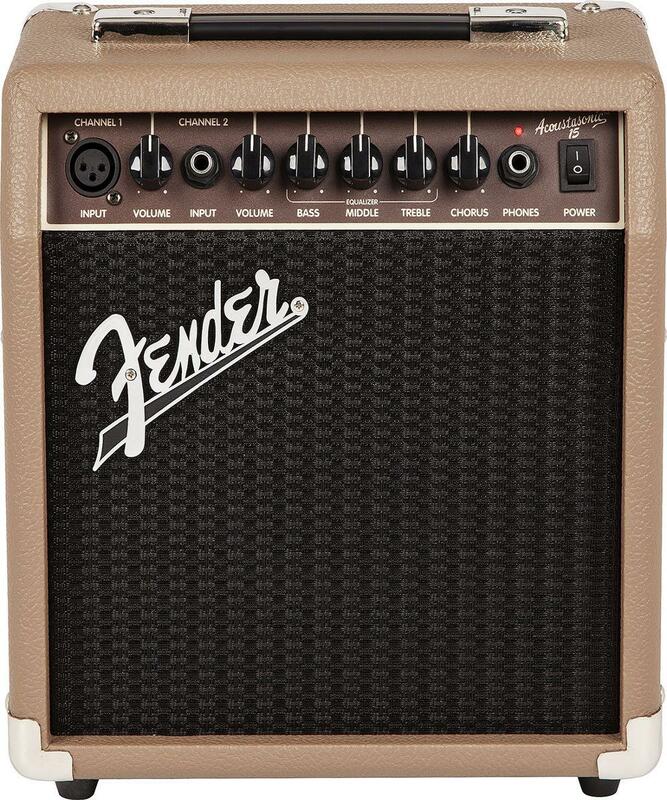 It continues to be a favorite for those looking for an all-around acoustic amp. A couple of people complained that the Reverb can't be applied to one channel only - it goes on both channels at the same time. Another person complained that the two XLR outs sum both channels meaning that you can't send guitar and vocals separately to a mixer but that is an uncommon setup that few people will need. A few people said it wasn't as loud as they expected - there are similar comments about most acoustic amps. The combination of features and clarity of the sound make this a good buy at just under $500. 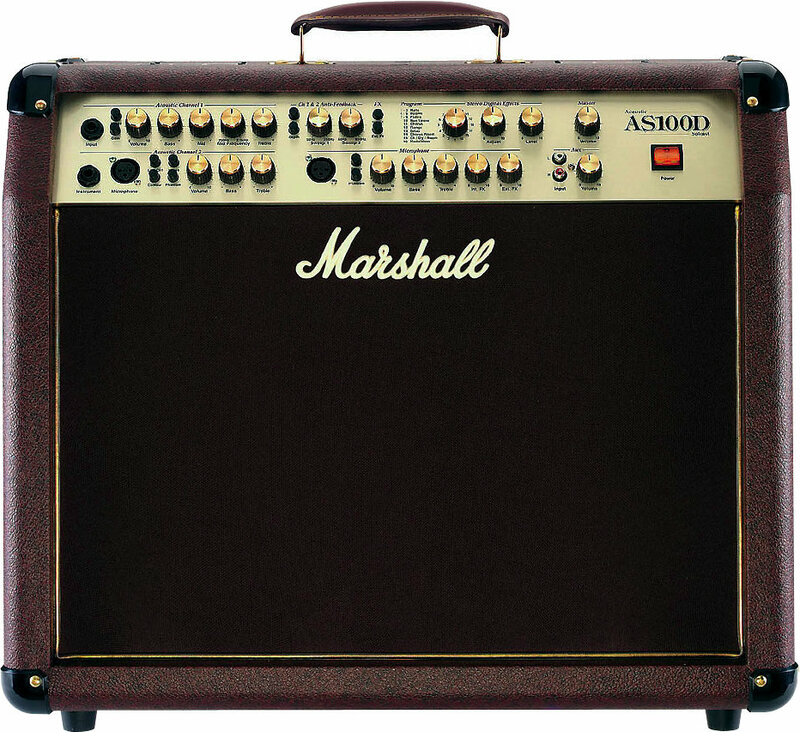 The AS100D is the larger of the two amps in Marshall's Artist Series acoustic guitar amps with 4 channels, stereo output, and 100 watts of power (50 watts per side). This one is designed for gigging and playing at larger venues. In his review for Acoustic Magazine Guy Little said, "Whilst this is a great sounding amp, it’s definitely intended for stage use. If you want a nice tone for your guitar alone, around the house and practice room, this big lump of an amp is going to stretch your arm far more than is really merited. If, however, you want a good stage amp which can cut it even when you need two guitars and vocals, it might just be the amp for you. At a keen price, too!". Dimensions: 23.82" x 20.87" x 10.63"
Customer reviews consistently rave about the quality of the sound this amp produces - I even read one review where the customer said they liked it so much that they've purchased their 4th one! It is commended multiple times for its ease of use, which is quite surprising giving the number of controls it has available. There were a few people who complained about it only having 15V phantom power instead of 48V which means you're limited in the number of condenser mics you can use otherwise they might not sound as good as you're used to them sounding. 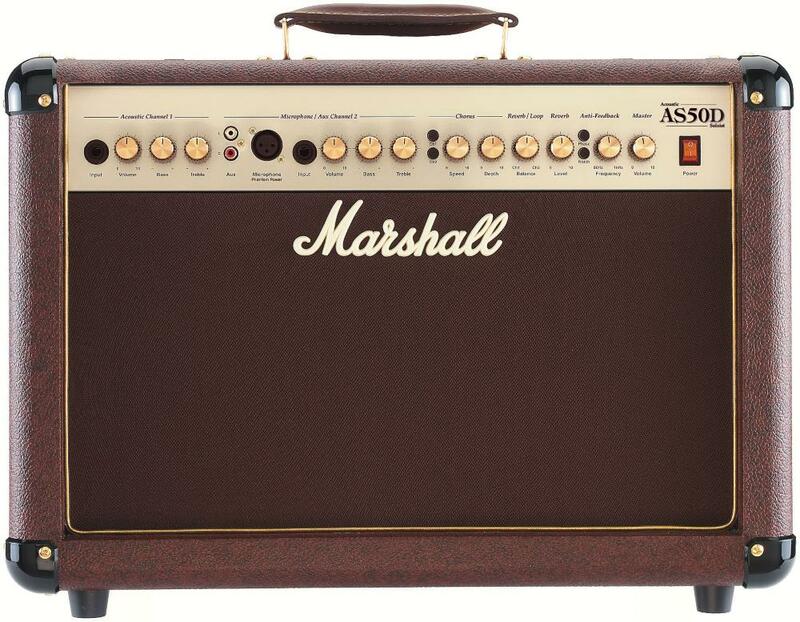 The Marshall AS100D is great acoustic amp that performs well both on stages and in the studio. 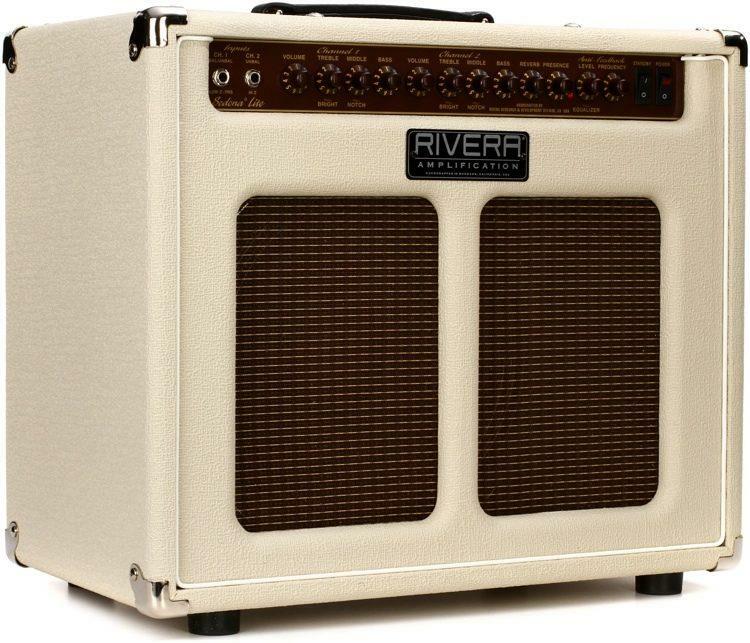 The Rivera Sedona is a hybrid tube combo amp that works for both electric and acoustic-electric guitars. It is rated at 55 watts with a 12" Celestion G12T-75 speaker. Channel 1 is designed for acoustic-electric guitars, with EQ controls for tone shaping and a 1" dome tweeter to handle the extra high frequencies of acoustic instruments. 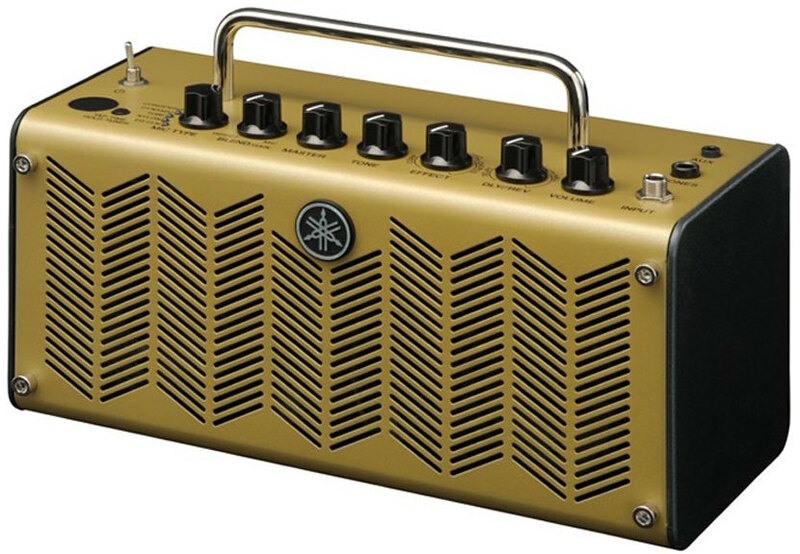 Like many acoustic amps, this one has anti-feedback controls. It also comes with a built-in ES (Taylor's Expression System) option for better pairing with Taylor acoustic guitars. Channel 2 works like a clean tube amp, and is designed to handle electric guitars along with pedals. It comes complete with dedicated EQ and reverb. Dimensions: 20.75" x 12" x 18"
The versatility of this amp gets a lot of commendations, especially from those who regularly switch between electric and acoustic guitars. There are also a lot of positive comments about its acoustic tone, as well as its electric tone, thanks to its tube amplifier design. Many Taylor guitar owners also chipped in with their thumbs up, but it is not limited to just them - even those with Martin guitars have plenty of good things to say about the Rivera Sedona Lite. There aren't any notable complaints with this amp, but note that the Rivera Sedona Lite, being a tube amplifier, is heavier than solidstate amps. If you want to make the most out of your Taylor acoustic-electric guitar, or you want an acoustic guitar amp that can serve electric guitars, then check out the Rivera Sedona Lite. These are the high powered amps that can cope with just about any task you have for them. Like its bigger sibling below, the 120-Watt 2-Channel Loudbox Artist is bi-amplified with completely independent channels. Actually, you can get it to work as a 3-channel amp by using the Aux input in the back as explained in the video below. The main differences between this and the Loudbox Performer are the power rating and having a 2-way speaker system instead of 3-way. The Decemberists' bassist Nate Query is one of the notable artists that use a Loudbox Artist amp, for his upright bass. Just like the Loudbox Performer below, many customer reviewers say this is the best acoustic guitar amp they've owned - a common citation was that this is the most 'natural' sounding amp they've had. Many customers say this is loud enough for mid-sized venues without having to use the DI outs to a PA. The sound was applauded with respect to both guitar and vocals. Gayla Drake, in her Premier Guitar review gave the following verdict, "For a small-to-medium room where people shut up and listen, the Loudbox Artist is fantastic amp. As a DI out to a house sound system it works spectacularly as well, because it’s a great stage monitor. If you love portability, can use a little extra power and useful built-in effects, and like the versatility the Loudbox Artist is a great place to start your amp search—it’s good enough that it might just end there too". You can watch her video review below. The only consistent negative, which was reported by a small number of people, is that the coating on the outside of the amp damages easily and eventually begins to peel off. 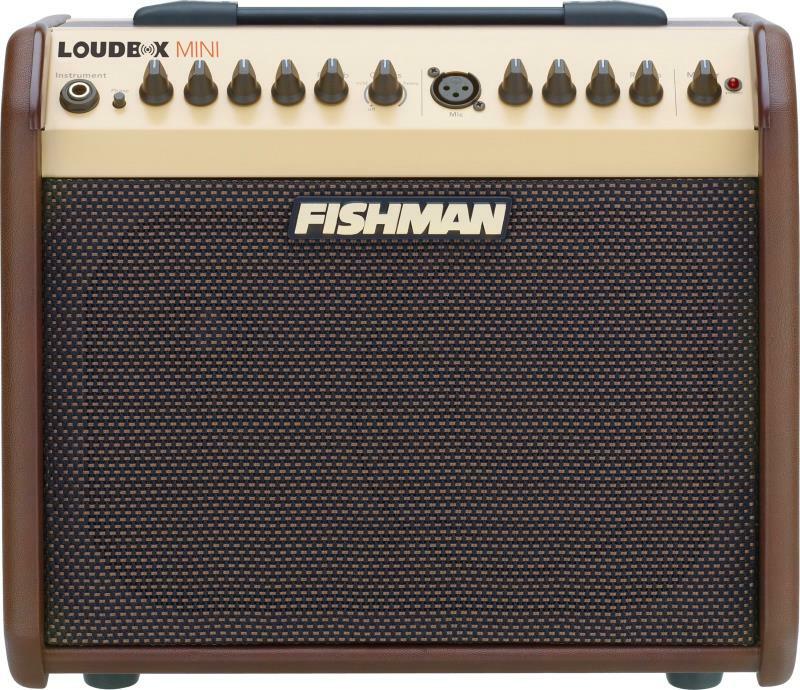 With its consistently high ratings and reviews, the Fishman Loudbox Artist is an easy recommendation. 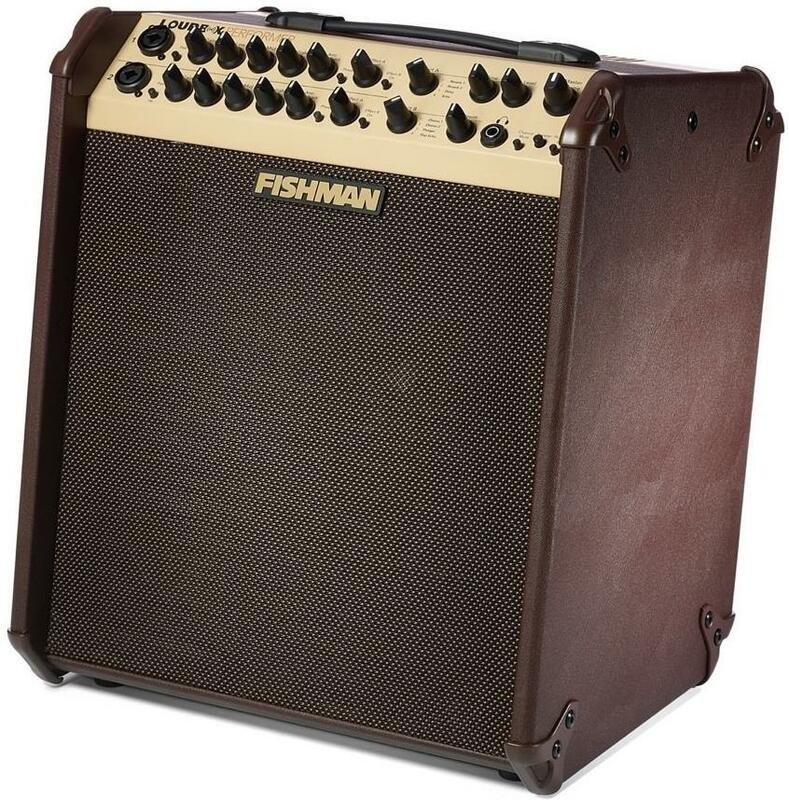 This is Fishman's most powerful acoustic amp. It's very well suited for use as a small PA for solo and duo acts as well as for performing with larger bands. Many customers who reviewed the Loudbox Performer said this is the best acoustic amp they've ever owned. Reviewers have praised its sound when used with guitars, vocals, violins and even synths. Even a majority of the small number of negative reviews praised the sound quality. The fact that it is bi-amped with both channels being completely independent was cited as a reason many people bought it. Sam Wise, in his Acoustic Magazine review, summed it up by saying "It’s rugged, professional, well-equipped, and it just works. We can do no more or less than to recommend it strongly to anyone who needs a dependable amp for live performance". Same as the Loudbox Artist, a small number of people report problems with the outside coating becoming damaged or peeling off. The issue with the coating aside, the Fishman Loudbox Performer gets about as close to being universally praised as anyone could expect. Mesa/Boogie is well known in electric guitar circles, especially among those who are into high-gain style tones. They have since expanded into acoustic guitar amplification, and thanks to the Rosette Two:Eight, they are raking good market feedback. Rated at 300W, this is a true workhorse amp, with two independent channels with dedicated volume, EQ and other tone shaping controls. Speaking of EQ, each channel gives you 4-band EQ control along with high pass filters, allowing for in depth tone shaping. Channel one has a switchable XLR input, incase you want to plug-in a microphone. other features include multiple reverb types, and a built-in parallel effects loop. Inputs: 1 x XLR w/ Phantom Power, 2 x 1/4", 1 x 1/4"
Great, awesome and excellent are just three of the many positive adjectives that owners use to describe the Mesa/Boogie Rosette Two:Eight. Sound quality gets the bulk of thumbs up, while others are happy with how much control the amp gives. Reliability and volume also come up often in reviews. Adam Perlmutter of Premier Guitar said, "It’s beautifully built in the U.S., it sounds great, and it is highly flexible in real-world performance and detail-oriented sound-shaping situations." While there aren't that many complaints about its sound and overall performance, there are some who wish that the price was more accessible. 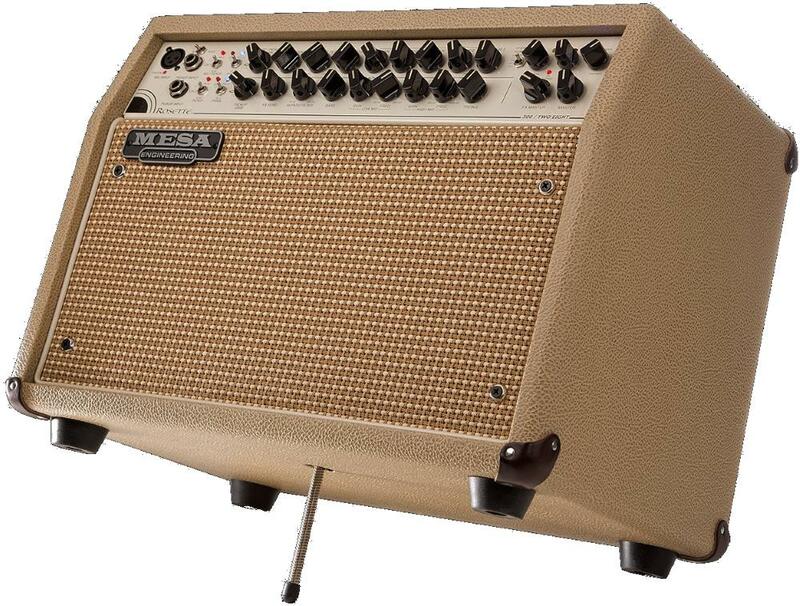 If you are looking to invest on a reliable boutique quality acoustic amp, then check out the Mesa/Boogie Rosette Two:Eight. For those working with strict budget constraints, here is a reasonable quality acoustic guitar amplifier that will save you quite a lot of cash. The Fender Acoustisonic 15 is an affordable entry-level acoustic amplifier, rated at 15 watts. It is as straightforward as its price, with basic controls and a compact profile that makes it an easy grab and go amplifier for acoustic-electric guitars. Value for money and portability are two of its strongest points, but there are also plenty of reviewers who are happy with its sound. While many of the positive reviews are from beginners, it impresses even experienced players who describe the sound as transparent and sweet. Some even go so far as calling it their best practice amp. While there are no direct complaints about its sound or features, there are those who wish that it had more features like the ability to run on batteries, or the inclusion of a reverb effect, but that's a bit unrealistic at this low price. If you're looking for a budget friendly practice acoustic guitar amp, the Fender Acoustasonic 15 is highly recommended. Acoustic guitar amps are quite different in nature to electric guitar amps, so if this is your first venture into getting an amp for your acoustic instrument, please read the following carefully to help ensure you get the best possible amp for your needs. An electric guitar amp is meant to color the sound in pleasing ways and to be a significant part of your tone, whilst an acoustic amp is meant to reproduce the sound of your instrument as accurately as possible with as little coloration as possible - this is referred to as 'transparency'. Electric amplifiers allow you to really crank them up usually introducing harmonic distortion as they get really loud. Because this is unwanted in an acoustic amp they will typically limit the volume before any significant harmonic distortion is introduced which leads to an acoustic amp of the same power rating as an electric amp not quite sounding as loud. You will often see customer reviews in which a new acoustic amp owners says something to the effect, "it's not as loud as I expected" - which of course, is to be expected. If you are going to sing through your amp while playing then there are a couple of important issues to consider. Firstly, if you use condenser mics then you'll need to get an amp that provides phantom power (unless your mic uses batteries). Different amps provide different levels of voltage with the most common being 15V, 24V and 48V. Check to make sure the amp you want is compatible with the condenser mics you intend to use. If you only use dynamic mics like the SM58 then this isn't an issue for you. For more information on microphones see our guide to The Best Live Vocal Mics. Secondly, some amps have completely independent channels for microphones and instruments whilst others share features between channels such as effects and DI outs. Read the details of each amp carefully to ensure it has the channel configuration you need for simultaneously playing instruments and singing through it. The threat of feedback is an ever present concern when using acoustic amps, particularly with acoustic guitars because they resonate so well. You can run into problems at high volumes and sometimes at lower volumes depending on the acoustics of the room you're playing in. The simplest solution is to adjust the EQ but getting an amp with anti-feedback features will make life easier for you in the long run. Different amps take different approaches to the problem but in general Notch Filters are more effective than phase switches. Instead of using a dedicated acoustic guitar amp some guitarists plug into the PA system using an acoustic preamp. Note that due to the high impedance of pickups you can't plug directly into your mixing console without going through a preamp first, and you should use as short of a cable as possible from your guitar to the preamp. You can learn more about this in our guide to Acoustic Preamps. We looked at all of the acoustic amps specifically designed for guitar that were available at major online music gear retailers in the USA. Note that we did not include modeling amps that provide models of acoustic amps despite the fact that some retailers include modeling amps in their acoustic amp category pages. For more information about this process see How Gearank Works. Submitted by Steve Reese (not verified) on Jul. 21, 2016. Where is the ZT Lunchbox Acoustic? Much more natural sound than the Fishman Mini, which it compares to in size, cost, and performance but not wattage. Wattage is subjective - it doesn't always correlate to volume. Submitted by Jason Horton on Jul. 22, 2016. Thank you very much for asking about that Steve because you've given me the opportunity to explain what some people might have thought was an accidental omission on our part - it was not. The ZT Amplifiers Lunchbox Acoustic failed to get past the first phase of our screening process because it had too many negative customer reviews, many of which complained about it not being loud enough for a 200 watt amp. ZT Amplifiers chose to market the Lunchbox Acoustic using the higher Peak Musical Power rating of 200 watts instead of using the industry standard for guitar amps which is Root Mean Square (RMS). Had they chosen to promote it using a lower RMS power rating then it's reasonable to think that it wouldn't have attracted so many complaints about the lack of volume. The net result was that the Gearank algorithm was only able to give the Lunchbox Acoustic a Gearank score of 78. In the interests of transparency I have included the Lunchbox Acoustic in our public gear database so everyone can see its Gearank score along with all the other amps. Submitted by John Manning (not verified) on Jul. 28, 2016. How does it compare with the others other than the issue of volume? Submitted by Jason Horton on Jul. 28, 2016. Hi John - at the current time we are only providing overall ratings with the Gearank algorithm, for now you'll have to evaluate the Lunchbox Acoustic amp the old fashioned way by reading what users have to say in the comments here or on websites such as Harmony Central and gearslutz. Submitted by Darrel (not verified) on Jul. 23, 2016. Submitted by Jason Horton on Jul. 23, 2016. The above report was not based upon personal preferences as your comment would seem to imply, rather it was based upon the criteria set out in the Methodology section above. One of the criteria was that an amp had to be available at major online music gear retailers in the USA. At the time of publishing both this guide and this comment, Schertler amplifiers were not available at Guitar Center, Musicians Friend, zZounds, AMS, Sam Ash, B&H, or our sponsor Sweetwater. It seems that in order to buy a Schertler amp online from within the USA you currently either have to go to an overseas music gear specialist such as Thonmann (31Kg/~68lbs shipping weight limit), or to a 3rd party seller via services such as Reverb, Amazon or eBay. Before buying through any non-standard process, I would check with the manufacturer to see if I would get a valid warranty and where I would have to send the amp if it ever needed to be repaired. BTW - if anyone does know of an authorized Schertler dealer in the USA, please leave a comment about them here. Submitted by Dan (not verified) on Nov. 28, 2016. Shoreline Music is a dealer for Schertler amps. Submitted by Dodo (not verified) on Dec. 14, 2016. It is very useful, but in my opinion would be better to have more precise gradation. If I can suggest groups could be divide to up to 30W, up to 80W, up to 120W and more than 120W. Thank you dodo - we will take your suggestion into account when we update this guide - this kind of feedback is quite useful! Submitted by Eddie (not verified) on Dec. 19, 2016. We didn't rate the Rivera Sedona dual electric/acoustic amps back when we first published this guide because there was only limited availability of them from US retailers at the time - possibly because they're significantly more expensive than standard acoustic amps. But thanks for asking the question - we'll make sure to include Rivera Sedona in our music gear database when this guide is next updated - that may result in them being included in this guide given how highly they are spoken of by people that review or comment about their experiences using them. Submitted by JazzyJ (not verified) on Mar. 21, 2017. You've missed quite a lot of quality acoustic amps and the biggest speaker size you've reviewed is 8". An 8" speaker is never going to be enough for a large venue without DI no matter what your review says. An 8" speaker imo is a practice amp! You'll need a 12" or a 15" to play a big venue without DI. You simply can't get a proper bass response out of an 8" speaker. If you could then PA systems in clubs would have 8" speakers! • Genz Benz - Shen 150LT and Shen 300LT - much more than 100W!! Saying that, all of those amps above are quite expensive. How about a Trace acoustic TA50R 'slaved' to a Carlbro Sherwood Classic 100w (15" speaker) - that rocks! Thanks for your feedback JazzyJ. In all the large venues I've worked in from indoor halls to outdoor amphitheaters, either as a performer or in the tech crew, no acoustic amp would have been sufficient on it's own. The standard practice in these situations is to either take a line-out (DI out preferably) or to mic the amp. In other words, in large venues the amp serves as an on-stage monitor where the PA and its Front of House stacks with large 15" and sometimes bigger cones being used to provide most of the amplified sound for the audience. I'm pretty sure that most of the amps you mentioned were included in our survey, but didn't meet our availability criterion as mentioned in the Methodology section above or didn't have high enough ratings to be short-listed. We've since relaxed the availability rule a bit to include manufacturers like Carvin which mostly sell direct so they will be included in our short-list when we next update this guide. Some of the other amps you mentioned are mostly available second hand and people can look for them on reverb or ebay, but I'll make sure we check out the latest from those brands when we next update this guide. Your idea about using an acoustic preamp in combination with a powered PA speaker is a good one - I see many acts in my area doing that or using a preamp and going direct to the PA these days. Submitted by Sebastian VS (not verified) on Jun. 7, 2017. Submitted by Jason Horton on Jun. 7, 2017. I'm not sure exactly which gear Usman Riaz uses, but a few years ago I asked a similar artist, Jon Gomm, what gear he used and he gave me a complete rundown in this article I wrote for GuitarSite.com: Jon Gomm Rig. Submitted by Les (not verified) on Jul. 25, 2017. Submitted by Jason Horton on Nov. 7, 2017. As a result of the November 2017 update for this guide, the following amp was removed from our recommended list but you can still read our meta review of it: Behringer Ultracoustic ACX450. Submitted by Len (not verified) on Apr. 2, 2018. What about the Crate Acoustics? i have seen used ones- how do they rate? They didn't make the short-list the last time we updated this guide, but if they are widely available in the USA when we next update then they might make the list. Submitted by Mr Dean (not verified) on Apr. 26, 2018. Good info. I'm going a set from mic to speaker for my acoustic guitar. Submitted by Andrew Blake (not verified) on Jul. 14, 2018. What about the Mesa Boogie Rosette? How does it compare to the Fishman Loudbox Pro & AER? The Mesa/Boogie Rosette Two:Eight made it onto our recommended list this year and it is currently the equal 2nd highest rated amp in the over 100 watt category along side the Fishman Loudbox Performer. I'm not sure which one of the AER amps you're referring to but you can see our ratings for their amps here.